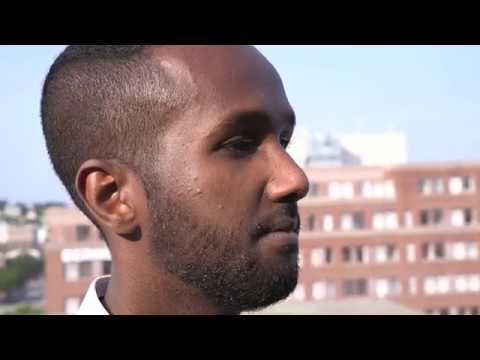 It’s all in the family – Mohamed Abdirahman’s family – when it comes to the Portland Public Schools.Mohamed, whose family emigrated to the U.S. from Somalia when he was a boy, is a 2011 Deering High School graduate. He graduated from Brandeis University in 2015 and now works as a risk analyst at CashStar, a Portland-based digital gifting platform. Mohamed was the first in his family of nine children to graduate from the Portland Public Schools and attend an elite college. Four of his siblings have followed in his footsteps, and his other four siblings are currently making their way through the school system. His parents also are a part of the Portland Public Schools, where they work as custodians. They attended Portland Adult Education to earn their high school diplomas, and are now taking courses at the University of Southern Maine to become educational technicians. His parents’ belief in education is what inspires everyone, said Mohamed, 24. His mother was in graduate school to become a veterinarian with just one class left to finish when war broke out in Somalia and they had to leave. His father, a businessman, also believes strongly in education, Mohamed said. His parents came to Portland because they’d heard about the quality of the Portland Public Schools. Mohamed started in first grade at Reiche Community School, then attended King Middle School before Deering. One of the best things about his school experience was the diversity, Mohamed said. The Portland Public Schools is Maine’s largest and most diverse school system. More than 60 languages are spoken by families of district students. His experience with diversity helped him while attending college in Boston and also when he lived in New York City, where he worked for his first year out of college as an executive assistant in an investment-banking firm. “Living in places like Boston or New York City, you’re around almost every culture you can imagine, and it’s definitely helpful in navigating your education and navigating work and learning how to be around different types of people,” Mohamed said. At Deering, Mohamed participated in Make It Happen!, a Portland Public Schools Multilingual & Multicultural Center college-readiness and academic success program for language minority students. It is designed to help students raise and realize their academic aspirations, so is particularly helpful to students like Mohamed, the first in their families to go to an American college. “That was the most connected I felt in school, through that program and the activities we had,” Mohamed said. The activities included everything from practicing resume writing to hiking, he said. He also welcomed the opportunity to take Advanced Placement courses at Deering and is glad that the school offers an even wider range of AP courses to students today. After his year in New York, Mohamed decided to return to Portland to live and work not only because his family lives here, but “because it’s home.” He was working as a pricing associate at Competitive Energy Services in Portland – a company that provides strategic energy consulting services throughout the U.S. and Canada – but joined CashStar this summer. Because Portland has given so much to his family, Mohamed strives to give to the community as a volunteer. For example, He’s on the board of Greater Portland Family Promise, an interfaith nonprofit that works to address the needs of homeless families. “I’m trying to do my part,” Mohamed said.